I am compiling a list of effective cello teachers, to be kept on my website. Note the word effective. There are plenty of bitter, ineffective, gnarly string teachers out there. I’m looking for people who you have really gained from. Eric Edberg, pictured here, is an ideal example. Massive chops, lots of cred, very accessible. Send information to: contact (at) emilywright (dot) net. A few details would be great, like whether or not they do Suzuki, overall demeanor, if they take beginners, etc. I’d like a pretty robust list, so please spread the word! I am not a cellist, but I very much enjoyed coaching and playing chamber music with Tim Eddy. From the second cello part of Verklaerte Nacht, he held the whole thing together. It was like he was the Foundation of the Earth in this cosmic, mystical way. I was awestruck, frankly. Hi Emily, I`m Marcelo M Vieira, Brazilian cellist living in the US. I`m a Graduate student at Louisiana State University, under prof. Dennis Parker. 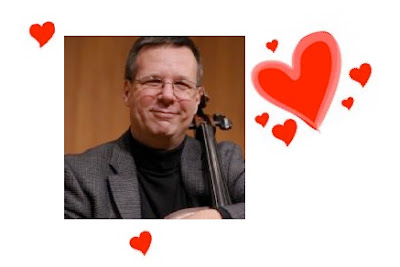 Dennis is an amazing cellist, excellent teacher and is also all about friendship, he`s just a fine hyman being. I would put him in any cello teachers list. I don`t tink he`s teaching private lessons right now, but he teaches at LSU, give masterclasses all over US, Latin America and Europe, and is always teaching in festivals and camps too. He`s open minded and all about cello playing, no interpretation patrolling, the goal is to make cello playing more easy and pleasant, trying to find comfortable positions and ways to make things work and sound good. He wrote a book on Popper High School and recorded the whole thing on DVD (The Popper Manifesto). He`s also a sculptor, using pieces of old instruments and wood ina very original way. I teach cello private lessons, but lately I`ve been focusing strongly on improvisational and creative techniques and ways to develop self-expression. Also, in a more advanced level, I have developed(still developing) a system for cello chords and harmonic and rhythmic accompanying on the cello. I played with bands and singers in Brazil and am also instructor for Brazilian music. I`ve been teaching in Christian Howes` camp last month, also about how to create string parts for pop music on the spot. my top work project right now is the Cello7Voice(I`ve bee experimenting to teach singing and playing too, with kids here in Baton Rouge).